I love ice cream. I really love vanilla ice cream with toppings. Toppings just seem fun to me. Maybe it is why I jumped with both feet into the frozen yogurt scene. I love the toppings as much if not more than the frozen yogurt itself. (Please tell me I am not alone in this.) 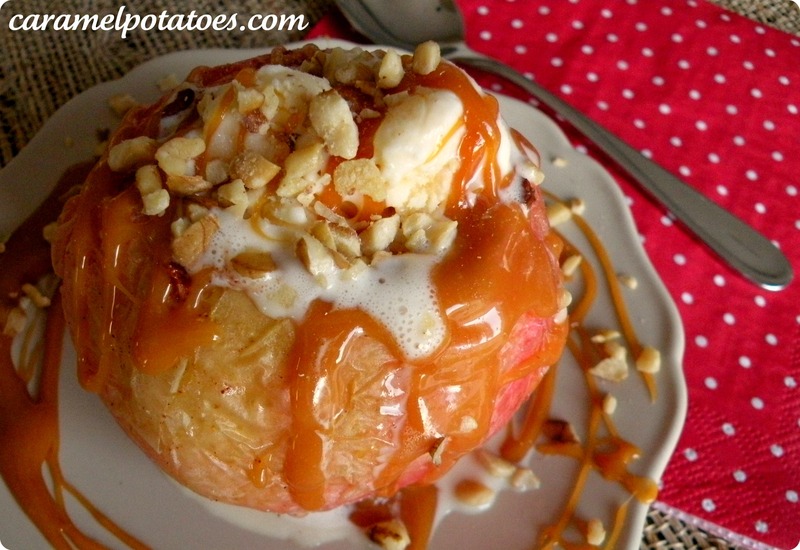 So I know what you are probably thinking…the ice cream is inside the apple, it is not a topping. Well, technically the ice cream is inside and the apple is not on top at all. But because the apples are baked they are soft enough to cut through with a spoon. So, you can eat the entire thing here!! Eat the apple right along with the ice cream. It is delicious-I promise!! This is a super simple dessert with a fun wow factor! You are going to want to try this one. Preheat oven to 350. Combine brown sugar and cinnamon in small bowel and set aside. Wash each apple and pat dry. Using a small paring knife core the apple. Be sure to not cut all the way through the apple. You should have a hole at the top that is about an inch in diameter. Place apples in a square baking dish. Divide the brown sugar among the apples. Be sure to cover the entire inside of each apple. Bake apples 40-50 minutes. Apples should still hold their shape but be cooked through. You will hear popping and the juices will leak out of the apple-this is okay! Place apples in serving dishes and fill with ice cream. It works best to use a small scoop, like you would use for cookie dough. Drizzle caramel and nuts over the top. Serve immediately. 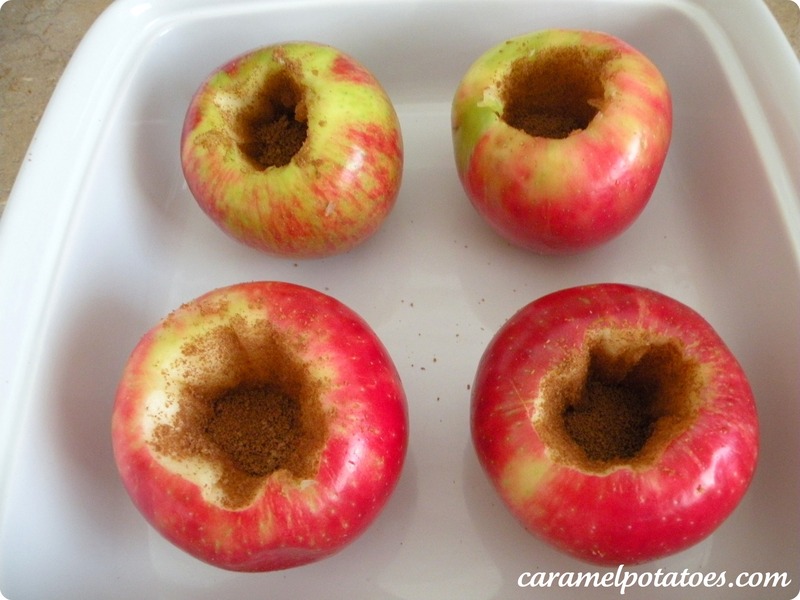 **Note: Be sure to use apples that can hold up to baking and that you like the flavor of. In my experimenting I really prefer the honey crisp apple for this, but there are countless varieties of apples out there so find your favorite!! You might include …core the apple…in your directions..some new cooks might not realize this….. Thanks so much for catching this!!! I type faster than I think sometimes, especially during fall break when all my kids are home 😉 I hope all is well with your family. It was great to meet you at the wedding this summer. Be sure to enter our giveaway!! I finally had a chance to sit down and review your site. Love, love, love the creativity. 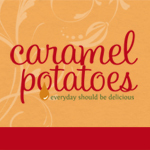 I’m making the caramel sundaes tonight, along with the smashed red,crispy potatoes and will serve the caramel, sliced-apple recipe at my grand daughters ‘Teen Halloween’ part this week. Keep up the inventive recipes coming…Especially, the eye candy recipes. Thank you for following Blog Hops Everyday and your support. We are now following you back. Please spread the word to help us grow any way you can. Thank you for your time. YUM!!! I love this so yummy but simple. Would you share your recipe at CAST PARTY WEDNESDAY tomorrow? oh my this look so sinful. I haven’t baked apples in ages! thanks for remining me how good they can be! oh my goodness–mouth is watering! This looks amazing! Such a perfect dessert for fall, thanks for sharing. Lovely blog, wonderful to meet you! Have you ever tried this with pears? I worked where they had a similar recipe but used pears, I never got their recipe but was always looking for something similar to make because they were amazing! Sounds Delicious – Thanks for the tip!